Hit a homer with your next gift to your favorite Texas Rangers superfan with our Personalized Uniform Locker Room Framed Wall Art. This premium MLB sports decor is guaranteed to delight! 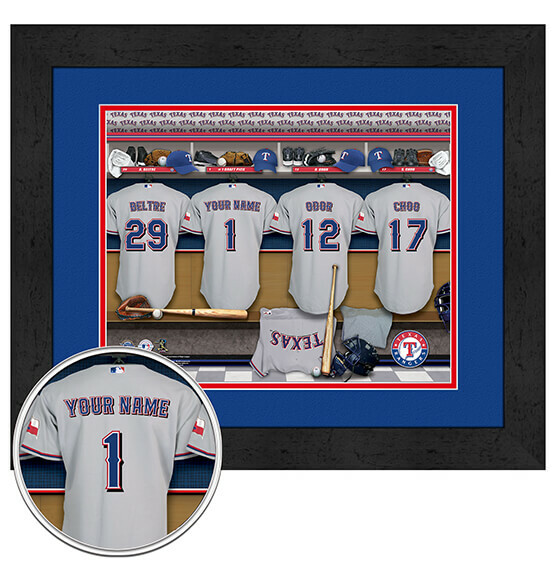 Customize this great print by adding the name or nickname of your choice to the back of a Rangers jersey. We've added high-end details like a double digital mat in team colors and an elegant black frame. This piece comes ready to hang thanks to its included sawtooth hanger. Make a Rangers fan's next birthday, anniversary or holiday the best ever with custom baseball gifts from PersonalizedThings by Exposures.